I’m pretty obsessed with this site. 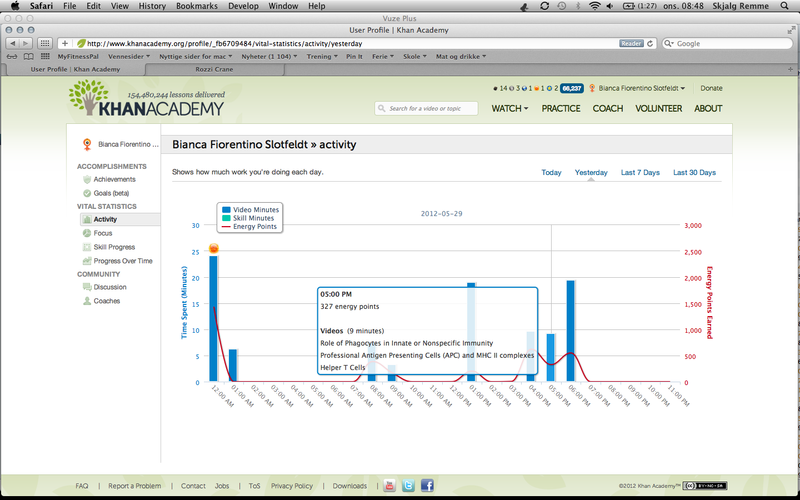 If I get into Semmelweis it will be in huge part to Khan Academy. The videos are addicting. I am able to study a large amount of information in a smaller amount of time – and I remember almost everything. On the way home from the doctor today, I mentally reviewing how neurons work and how the muscles contract and I was surprised to find that I remembered almost everything – and all after simply watching the video once and taking notes. When I got home, I asked Skjalg if I could teach it to him. I spent about half an hour drawing out the diagrams and explaining everything to him without looking at my notes. It felt amazing to be able to explain something so detailed without first needing to review it several times. One of my favorite features of the site is my personal profile. 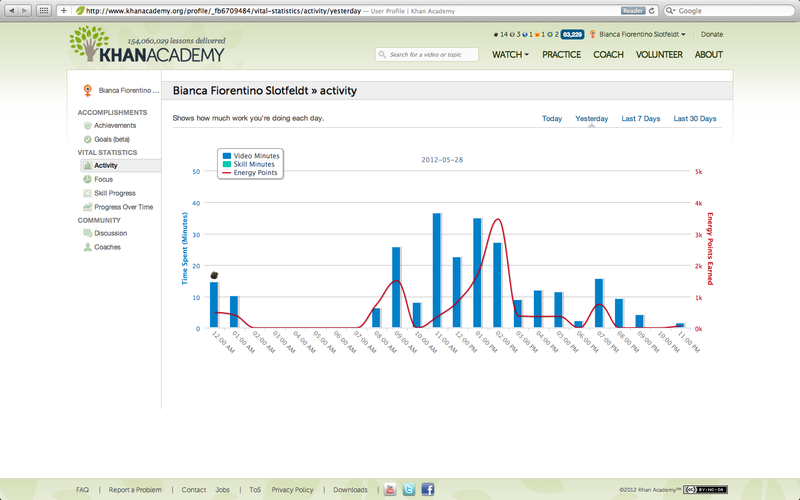 You get points for everything you do on the site and there is a statistics page that shows your progress throughout the day. Here is my progress from one of the days. As you can see, I studied until 2:00am and then began again at 8:00am – I’m having a lot of trouble sleeping! I was most efficient in the middle of the day and then less so once it was late at night. You can hover your mouse over the diagram and it will show you what that hour of work consisted of – which videos you watched, activities you’ve done, awards you received, etc. You are currently reading Khan Academy at Buda-B.